Well, it’s been 5 whole years since we met and so abruptly had to say goodbye. And even though you have not physically been here with us, what a profound impact you have had on our lives.Your brothers and sisters, even though they’ve never met you live every day with you as a very real part of their lives. As I think about how we SHOULD be preparing for your 5th birthday, I imagine a little boy beaming as he approaches every person he meets, holding out 5 fingers and announcing to the world “I’m five years old!” I imagine you being underfoot and getting into whatever surprises we have in store for you. I imagine a birthday cake with 4 smoldering candles and one still aflame with your older sisters pestering you about having a girlfriend…..that’s a wonderful image. Sadly, we don’t get that with you. Instead we will try our best as a family to commemorate your day. We’ll take the time to enjoy each other’s company. We’ll take your baby sister for her first swim at the pool, perhaps watch a Disney movie on the big screen, Ice Cream cake for the birthday boy, and if mommy’s up to it, we may even take in a Merritt Centennials game. We will do all these things out of an unquenchable love for you, and with good measure of sadness in our hearts that we do not get to celebrate with you. It’s been five years since we had to let you go, seems like an eternity already. I can only imagine that the years to come will likewise feel like an eternity, until that glorious day when we are all reunited in the presence of our Heavenly Father. I don’t know if any of this will ever make sense. But in your very short life, you have touched so many other lives, and arguably saved countless more. Today is a bittersweet day, as I received word from our lawyers that a lawsuit was filed on your behalf today to try and get the justice you deserve. This is everything that we have been fighting for for 5 years, and I hope that you are proud of us for fighting for you. Please watch over us dear Matthew, especially your little brother Daniel and baby sister Olivia. Happy Birthday in Heaven son. A huge shout out to our dear friend Christian Delahunty, Indiana’s mom. Indiana is another dear, sweet angel who was taken from this world because of the lies perpetrated by an industry whose sole interest is making money at all cost. It is nice to be reminded that we are not the only ones fighting to stop the madness of overmedicating women before, during and post pregnancy. These good folks are just one example of the great people fighting the good fight with us. Many of you who visit this page know our story, and have shared your story with us. Please, even if you have shared your story about how your life has been affected by these toxic pharmaceuticals, I welcome you to share your details on the contact form below. Who knows, this may develop into a book or something someday. Walls are all around me. Waves of sadness are drowning me. I just lost someone I love. Nothing can warm me up. I’m expected to move on like nothing happened. I’m afraid if I do there will be more pain. Slowly, timidly, I open up. The pain of death will always be there. But the birth of someone new brings the best cure. A cure that only God could have made. This poem was written by our daughter Emilie after losing Matthew and Simon and then bringing Daniel home. She touches on so many truths in such a few amount of words. I can feel her pain as I read this. I can feel her love too. These boys have truly touched our family and for that I am eternally grateful. The tears fall savagely from my face as they lower his small coffin into the ground. Then like a whisper in the wind I hear, “I’m still here”. I look around me, but the only people there are my family and they are crying as well. I re-focus on the tragedy in front of me and hug my mom. Jump forward a few weeks and my eyes are welling over as I prepare to press the razor to my skin and cut the pain away. I brace myself until I hear. “Please stop. I’m here. I’m still here.” So I stop. I throw away the razor and scream and cry. “PLEASE! PLEASE TALK TO ME AGAIN! PLEASE COME BACK!” I bawl at the ceiling. But of course he can’t hear me. Of course he doesn’t answer me. Skip ahead and the tears are falling from my face again. This time from relief. I’m graduating high school. I receive my awards then I’m congratulated and hugged by my family. For one split moment I think, “If only he was here to celebrate with me. If only he could be with me today.” And like magic I hear him, “I’m still here. And I’m proud of you.” I smile. To myself and to him. 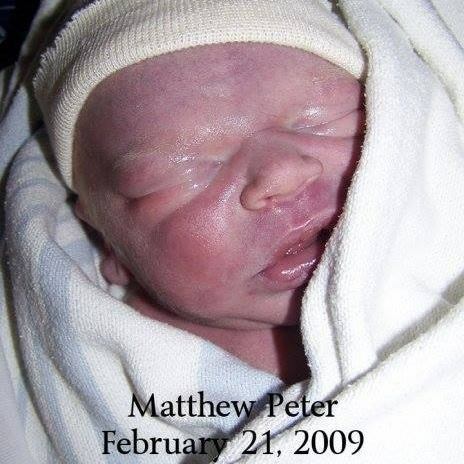 Continue on and baby Matthew’s all grown-up. My husband and I have grown elderly. Matthew’s gotten married and has a few kids of his own. I’m a grandma now. “That means he’d be a great uncle.” I think as I sit and crochet a hat for my oldest grandchild. “Hey, don’t worry.” I hear briefly. “I’m still here.” The tears roll, once again. “Will this ever end? Will the pain ever go away?” I think as I wipe my wet eyes. “Didn’t you hear me? I’m still here. I’m right here with you. Forever and always.” “Thank you.” I say it out loud, but as a whisper. As if I might scare him away if I speak any louder. But, he’s gone. Then he stands up, grabs my hand and we walk off together, smiling, knowing we’ll never be apart again. This story was written by our daughter Michelle when she was 15. It has been published in the book Gems of British Columbia. I must say we are very proud of her. And I am so moved that this little guy, our precious Matthew, has touched her life so much too. Another year is here. You would be four years old. I can’t believe it’s been this long and yet it still only feels like yesterday. It has been building up for days now and my anxiety and sadness is at it’s peak. My journey in grief is still only in it’s early stages. But I know your day will be nice since we will be focusing on your day as a holiday from school to be filled with thoughts of you and celebration. We will be missing daddy though as he is off in Washington, DC, fighting for your cause. It will be the first that we are not together today and I hope it will be the only time. I was reluctant to let him go, but mostly due to selfish reasons. I did not want to have to wake up and face today with the other kids alone on my hardest day of the year. I know it will be hard on daddy too, since he is so far away and alone. We don’t have each other to lean on to make it through the day. Luckily daddy’s day will be filled with you and our battle to save lives. He is lucky. He gets to be on the frontline for you. I get jealous sometimes since I have to be in the background supporting him and taking care of our family. I wish I could be up there with him talking about wonderful you and helping to prevent more deaths. But I am slowly accepting the fact that my place is taking care of your siblings and encouraging daddy to fight the good fight. Without me backing him up, could he do this? After four years, are we any further ahead? Some days I think not. Daniel wound up in the hospital again and the pediatrician offerred him medication to help stop his vomiting so he could rehydrate. She had no plans on giving him an IV. She decided on a drug. And even though we brought up drug risks, she went and got it anyway. She could have gone quickly to the computer and googled the drug to see that it is contraindicated in children under 3 and to not give it if the patient has electrolyte imbalance such as in dehydration. Or the other warnings Health Canada has put on it. Instead she came back and gave it to him. A few people have told us we had the right to refuse the drug. And yes we did. But how do you refuse a drug that she took out of it’s package as she came to our bed and then just shoved it in his mouth? Coming home and researching the drug, we would have definitely told her no. The study on it had shown that it is no better than placebo in children and in fact caused the vomiting children in the study to get diarreah. So I have to ask myself, how do these things get on the market? And then give it to my child under 2 with a heart defect? And the answer we get from the hospital? Those warnings have to be put there but don’t really need to be followed. All our work and this happens again? At least at the end, we were told that the hospital now monitors all newborn for their first 48 hours if they were exposed to antidepressants. That sounds like progress, only we didn’t see any proof. We’ve been jerked around so much, I am reluctant to believe them. And I question them if they even ask the women coming in if they are on them. I only pray that what they said is true and they are in fact doing this. Babies can be saved and maybe they’ll begin to notice how these exposed babies are reacting. That is a right step in the right direction. But I am still waiting for our case to be taken care of. I no longer want your death swept under the rug and pretend you never happened. So again, I face your day with sadness. I will get through it. I will enjoy it. We have so much planned today that it should be quite happy. The kids have been so excited for today. 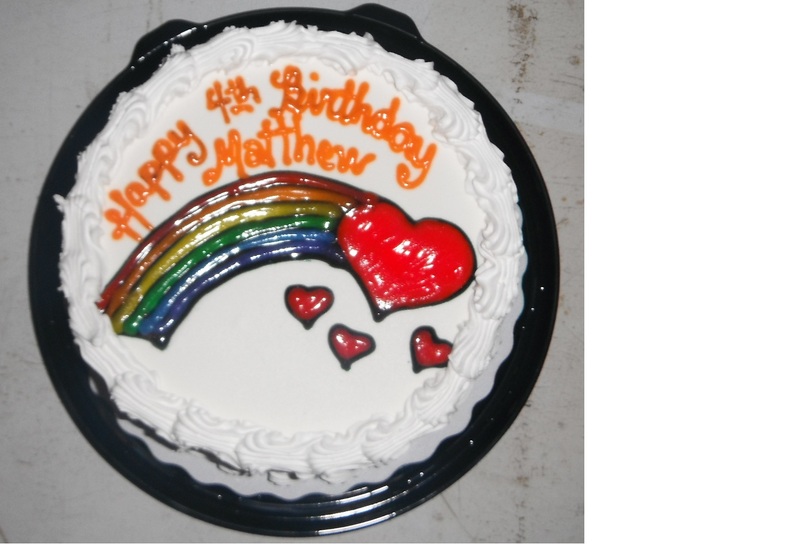 They picked your cake and balloons and plan to spend the afternoon decorating the kitchen and your wish lanterns. It will be so nice to send those off this year and I’m optimistic since it’s much warmer compared to last year. Will you be watching? WIll you be waiting for your balloons and lanterns? I wish I could begin to imagine what you would look like now and sound like. I dream of that often. As you watch us celebrate from heaven, please say a little prayer for daddy so he doesn’t feel so alone and for your siblings so they always remember you. Happy BIrthday little man. Mommy loves you so much. Lunochka on When will people get it? Amy James on When will people get it? Maria on When will people get it?